To create a Public Credit System, the creators and system administrators first need is to understand the privately owned currency system. This is how the US had been taken over by the British Empire, use them to conquer the world and install the Imperial monopolization with fake democracy, and most of Americans are not even aware about it, except their puppets, their bribed politicians, their Corporations and Institutions, including academics and scientists. Monday 23 December marks the 100th Anniversary of the creation of the Federal Reserve System - the Central Bank of the United States of America. Syria, Iran, Venezuela, North Korea and Hungary. Actually, it’s a “system”. Officially, the “Federal Reserve System” wields full control over the US Dollar, not to serve the American people but on the contrary the interests of private bankers, who hold its very special type of stocks and shares. In practice, the FED is over 95 percent privately-owned, is not integrated into the US Government, nor accountable to any branch of government. There is nothing “Federal” about it as it lies fully outside the government system of checks-and-balances. Nor does it “Reserve” anything. Rather it arbitrarily prints all the money the mega-bankers and power elites need to keep the “globalized” world rolling in the direction that they wish and need. This includes such things as multi-trillion dollar “quantitative easings” to keep Goldman Sachs, Bank of America, CityCorp, Wachovia and JPMorgan Chase happy and “healthy”; financing clandestine and terror operations to overthrow the governments of Iran, Nicaragua, Argentina, Cuba, Chile, Syria, Libya, Vietnam and many others; waging decades-long wars against Afghanistan, Pakistan, Iraq, Africa and Latin America; unflinchingly supporting “little Israel’s” genocide in Palestine and its “democratic” 400-bomb strong nuclear program; and keeping Wall Street on permanent life-support. Finally, it is definitely no “Bank” in the sense of a financial institution promoting the credit needs of the real economy for the benefit of the vast majority of the working population’s needs. 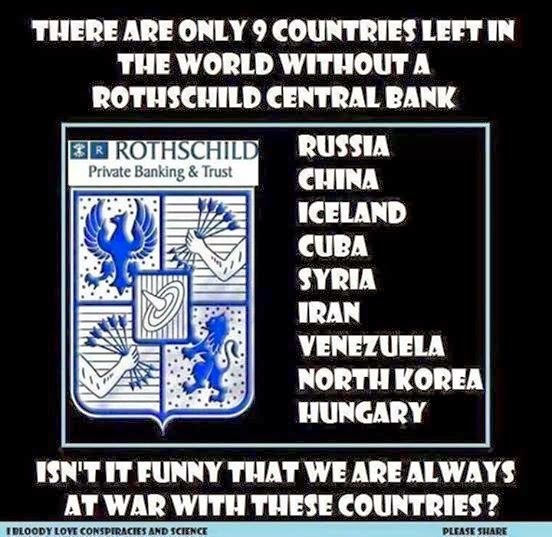 Rather, the FED supports the financial needs of the global war system, covert operations, usury, drug dealers, and the global banksters. The FED answers to no one. It clearly does not serve “We the People” of the US or anywhere else. Its purpose is to serve the global power elites, regularly meeting to plan world government through entities like the Council of Foreign Relations, Trilateral Commission, Bilderberg, World Economic Forum and others forming part of todays’ intricate planetary web of global money power. In a Public Broadcast System (PBS) interview on “News Hour” aired on September 18, 2007, US journalist Jim Lehrer had this Q&A session with former decades-long Fed Chairman (and JP Morgan bank officer) Alan Greenspan: Jim Lehrer: “What is the proper relationship between a chairman of the Fed and a president of the United States?” Alan Greenspan: “Well, first of all, the Federal Reserve is an independent agency, and that means, basically, that there is no other agency of government which can overrule actions that we take. So long as that is in place and there is no evidence that the administration or the Congress or anybody else is requesting that we do things other than what we think is the appropriate thing, then what the relationships are don’t frankly matter.” Huh? If you’re a US citizen, you should re-read the above once or twice. The FED System lies at the root of US “superpower” status. Allow me to explain how the FED scam really works from the point of view of someone living in Argentina - a very down-trodden country repeatedly made to bite the dust by the global power elites through their local agents imposed upon us through money-power “democracy”. This means that every time Argentina needs to buy 100 dollars-worth of, say, oil, medicines or technological components, the Argentine people must work to earn those 100 dollars through exports and genuine work. By comparison, every time the US Government needs to buy 100 dollars-worth of oil, medicines or whatever, all they need to do is tell the Fed to print 100 dollars and that’s that. Let’s just say that this makes it much easier to be a “superpower”. OK, the mechanism’s not that simple, but this certainly explains schematically how the whole US-Dollar power system really works. It also explains why the elites won’t tolerate anybody challenging the dollar. Look at the world’s oil market. It is a monopoly run by three global trading centers located in New York, London and Dubai. The idea is to ensure that “petro-dollars” flow around the world 24/7, and only incidental small amounts should flow back into the US financial system. This explains why when in late 2002 Saddam Hussein decided he would do his UN-sanctions authorized “One Billion Dollars Iraqi Oil for Food” trade with the West in euros instead of dollars, he was quickly visited by the Fed’s military branch in March 2003. Or take Muammar Kaddafi who in 2011 was about to launch a program to trade Libyan and North African oil using a new gold-backed currency – the gold dinar. He too got a little visit from Peace Prize Barack and Babylon Hillary. Do you begin to see the pattern? But don’t think that the FED’s global financial enslavement system is simply aimed outside the US; it kicked off a century ago by first silently enslaving the very people of the United States it is supposed to serve. Here’s how that works: every time the US Government decides to put money into circulation – those 1, 5, 10, 20, 50, 100 dollar bills we’re all so familiar with – instead of asking the government mint to print them at a penny’s cost in paper and ink, the government instead asks the private banksters at the Fed to print those bills for the Treasury, in exchange delivering to the Fed interest-bearing US Treasury Bills and Bonds, which translates into trillions of dollars’ in profits funneled to the private banking elite though the Fed. It was all so well planned a hundred years ago, that just before the Federal Reserve Act was passed on December 23, 1913, they also maneuvered to close this parasitic circle, for if the US Government was to begin making gigantic interest payments to the Fed just for printing its own money, they first needed to have a revenue scheme in place to milk the American taxpayer: the Income Tax Act! Actually, it was the 16th Amendment to the US Constitution passed by Congress in July 1909, and enacted as law in February 1913. Thus international banksters have been ripping off Americans and getting America to fight their wars as proxies for a full century, whilst most of the population haven’t got a clue of what’s going on. Clearly, the FED lies so far above the US White House, Congress and Supreme Court, that over the past five decades no one has been able to have a proper audit done on its books and numbers. Oh, you Homer Simpsons! Not that you haven’t been warned. In 1923, Minnesota representative, Charles Lindbergh, father of the famous aviator, sent an early warning: “The financial system has been turned over to the Federal Reserve Board which administers the finance system by authority of a purely profiteering group. The system is private, conducted for the sole purpose of obtaining the greatest possible profits from the use of other people’s money.” In the 60’s, republican senator and presidential candidate, Barry Goldwater, said “most Americans have no real understanding of the operation of international moneylenders; the accounts of the Federal Reserve system have never been audited; it operates outside the control of Congress and manipulates the credit of the United States.” Today, former representative, Ron Paul, has been sending the same message. Even president John Kennedy bloodline understood this when he issued Executive Order No. 11110 on June 4, 1963, ordering the US Treasury to print zero-interest public money to the tune of 4.3 billion dollars, fully bypassing the Fed. But he too ran into some trouble in Dallas barely five months later on 22 November.